This is a Package of 36 Fine Sanding Discs (240 grit) from Dremel. 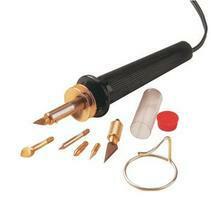 This Carving/Engraving Accessory is a 1/16" Engraving Cutter Bit by Dremel. 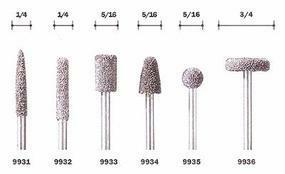 This is Dremel's Aluminum Oxide 3/8" Grinding Stone Accessory Bit. This Is Dremel's 1/4" Rubber Polishing Point Accessory Bit. This is the 5/16 Structured Tooth Tungsten Carbide Cutter Round (1/8 shank) by Dremel. 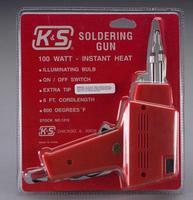 This is a 100 Watt Soldering Gun from K & S Engineering. This is Dremel's 3/32" Quick Change Collet. The Dremel VersaTip Plus is a professional quality, mulitpurpose, heated tool designed to perform a wide variety of tasks. This Carving/Engraving Accessory is a 1/32" Engraving Cutter Bit by Dremel. This is the Rotary Tool from Walnut Hollow.:. This is a Dremel Work Station. The Dremel Work Station will convert rotary tools to a drill press for drilling, to a tool holder for sanding and polishing, or to a flex shaft tool stand. This Carving/Engraving Accessory is a 5/64" High-Speed Cutter Bit by Dremel. This Is Dremel's Aluminum Oxide 1/8" Grinding Stone Accessory Bit. This is the Round Bur Holder with cover from Zona Tool Co. This is Dremel's 1" Felt Polishing Wheel Accessory Bit. This Carving/Engraving Accessory is a 5/16" High-Speed Cutter Bit by Dremel. This is the 7/8x1/8 Aluminuim Oxide Grinding Wheel (2/pk) by Dremel.